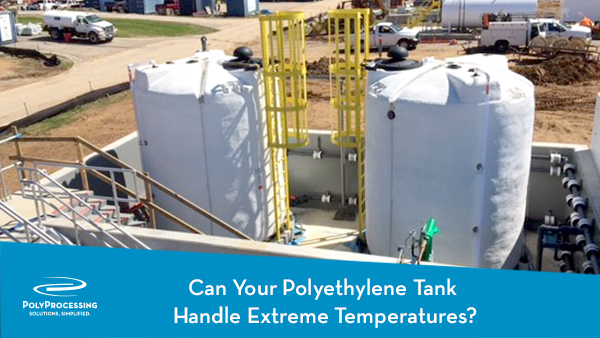 Can Your Polyethylene Tank Handle Extreme Temperatures? If you keep your polyethylene storage tank outdoors, it may be completely exposed to the elements. You can build a shelter to guard against UV attack, but you can’t protect a chemical tank from extreme heat or cold. In fact, one of our customers recently asked about keeping a polyethylene tank outdoors in extreme temperatures. I am concerned about using a 250-gallon SAFE-Tank for storage of concentrated sulfuric acid outside. Both for the 100F upper limit exposed in Texas sun, and for the possibility of freezing during an extended cold winter, since concentrated sulfuric acid freezes at 37F. One year in Austin, the temperature stayed between 10F and 25F for nearly 7 days. I looked around your website and found the 100F limit. Lately in summer we have been 105 to 110F, and this tank is in direct sun in the afternoon. If your company is in a region that gets extremely hot or cold, this could be a concern for you as well. How worried do you need to be about exposing your chemical storage tank to heat or cold, and what should you do about it? When it comes to temperature, there are two issues you need to think about: protecting your chemical storage tank, and protecting your stored chemicals. Is your polyethylene tank safe in the harshest winters? Realistically, there is no climate in the United States that endures dangerously cold temperatures long enough to impact a tank’s integrity. The ASTM standard states that we do an impact test at -20 F. Our tanks pass impact tests at -40 F.
We recently had a call from a customer in northern New York. Their water storage tank had frozen over, and they were delighted to find that there were no repercussions. There were no signs of distress, cracking or leaking. In fact, we have rarely had any issues with any of our tanks that are located in cold environments. But what about protecting the chemicals you're storing? To keep the chemical itself from freezing, we strongly advise customers to insulate the tank and use heating pads to maintain a temperature that’s safe for the chemical. If you're storing water, you won’t necessarily need to use heating pads—if you have an avenue for the water to overflow. Water expands as it freezes, so you’ll need to ensure that you don’t allow too much hoop stress, or internal pressure from the expanding ice. As long as your tank has vents and manways, the expanding water can escape the tank, preventing any tank damage from ice pressure. So your polyethylene chemical tank is safe in the winter. What about in extreme heat? We design our tanks to withstand chemical temperatures of 100 F. To be clear, that means your stored liquids shouldn’t be warmer than 100 F. It doesn’t mean that the ambient temperature of the environment shouldn’t exceed 100 F.
But if the ambient temperature exceeds 100 F, wouldn’t that also heat up the chemical inside the tank—especially if the tank is black? Ambient temperatures fluctuate much more quickly than the temperatures inside your chemical storage tank. First, the heat needs to penetrate the plastic tank, then it needs to heat hundreds or thousands of gallons of chemical. Even in the hottest areas of the country, by the time the environmental temperature begins to warm the chemical, the sun is already descending and the ambient temperature is falling. Your chemicals shouldn't be impacted in any meaningful way by environmental heat. Poly Processing can insulate the tank before it leaves our facility if chemical heat is a concern. For more information on extreme temperature and storage tanks, contact one of our chemical storage tank experts.